The majority of the pastures are cultivated with a combination of Bermuda grasses such as Coastal, Tifton 85, Jiggs and Dixiegrass as well as cool season perennials such as Oats and Ryegrass. Access to various fertilizer materials through an alternate enterprise offers Santa Rosa Ranch with the capability to maximize forage production with adequate rainfall. By using a rotational grazing system, SRR can balance the nutritional needs of the cattle while utilizing the available forage without stressing the land. In addition to traditional dry hay, Santa Rosa Ranch produces haylage, bailing and wrapping the cutting at approximately 50% moisture to produce forage with 18-20% crude protein. 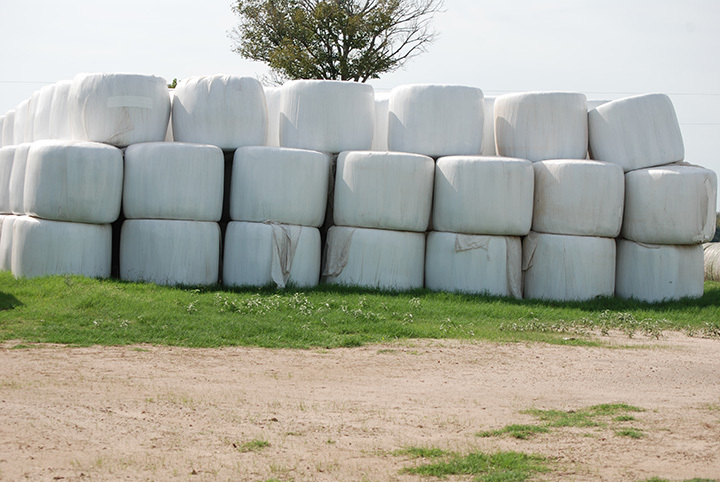 This process offers maximum nutritional availability of the forage for an extended time and reduces waste. SRR has recently started green-chopping mature small-grain forage for use in the operation as well. While all available forage is utilized in the operation, Santa Rosa Ranch uses a supplemental feeding program for developing bulls, heifers and backgrounding commercial steers and heifers. No hormonal implants or ionophores are given to the SRR herd so the all-natural program offers a unique product to the market considering the high weaning and yearling weights of the cattle. Vertical mixers are available to mix various batches, developed by a licensed nutritionist, to fulfill the specific needs for each program.